The afterlife was an important part of Ancient Egyptian culture. One of the ways they prepared for the afterlife was to try and preserve the body as long as possible. They did this through a process called embalming. These embalmed bodies are called mummies. How did they embalm the mummies? 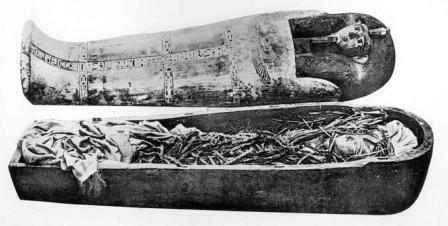 The Egyptians went through an elaborate process to preserve the body and keep it from decaying. It's a little gross, so we won't go into too much of the gory details. The main thing they did was try to get all the water and moisture out of the body. It's water that causes much of the decay. The Egyptians started out by covering the body with a salty crystal substance called natron. The natron would help to dry out the body. They would also take out some of the organs. With the body covered and stuffed with natron, they would let the body dry out for around 40 days. Once it was dry, they would use lotions on the skin to preserve it, reinforce the empty body with packing, and then cover the body in wraps of linen. They would use many layers of strips of linen wrapping, covering the entire body. Resin was used to glue the layers of wrap together. The total process could take up to 40 days. Once the body was all wrapped up, it was covered in a sheet called a shroud and placed in a stone coffin called a sarcophagus. Why did they care so much about the dead bodies? 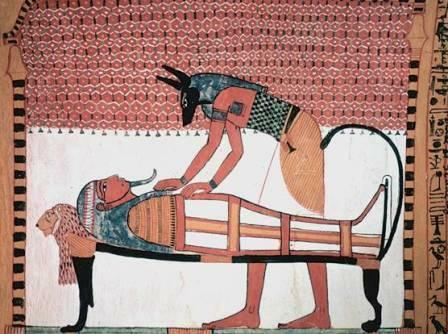 In the Egyptian religion, the body was needed in order for the soul or "ba" of the person to unite with the "ka" of the person in the afterlife. The body was an important part of the afterlife and they wanted to preserve it forever. Did everyone get this fancy embalming? Only the very rich could afford the best embalming. It was important to everyone, though, so they got the best that they could pay for and most of the dead were made into mummies. It is estimated that 70 million mummies were made in Egypt over the 3,000 years of the ancient civilization. There are still mummies of some of the ancient Pharaohs around. 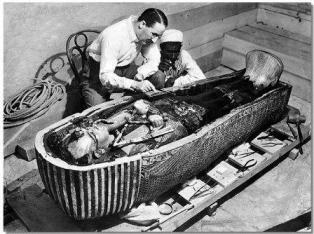 Both Tutankhamun and Rameses the Great were preserved and can be seen at museums. Over the past few thousands of years, many of the Egyptian mummies have been destroyed in interesting ways. Some were burned for fuel, some were ground into powder to make magical potions, and some were destroyed by treasure hunters. The heart was left in the body because it was considered to be the center of intelligence. The brain was thrown away because it was thought to be useless. Sometimes the mummy's mouth would be opened to symbolize breathing in the afterlife. It is probably this custom that led to the superstition that mummies come back to life. Mummies are studied by scientists without unwrapping them by using CAT scan and X-Ray machines.